Just a week ‘pottering about’ on Windwhistle & only two of us this time. Lovely! Overnighted in Ciftlik, Sogut, Selimiye, Bozburun & Bozukkale – each one fantastic in its own way and a great amount of variation too. A fabulous week with excellent food, good winds & lovely warm sunshine to prepare us for winter in the Isle of Man. And all rounded off with a day back at the new base, Adakoy. A great place to start and finish your holiday. 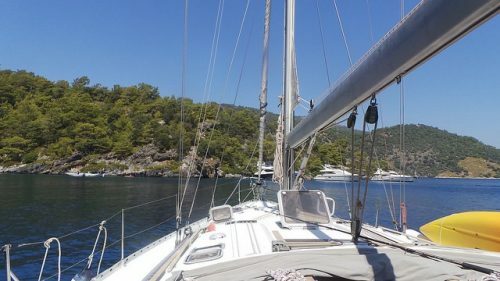 Take the boat to Marmaris – its easy and a nice trip across the bay. Mark & Stef looked after us well – as usual (although we can easily forget how good their reception & arrangements are ‘cos it all runs so smoothly) and we enjoyed a lovely meal with them at Neighbours in Marmaris, on our final evening. Thank you to them! As for Windwhistle – she’s in good health & a joy to stay on. The bowthrusters are a brilliant bit of kit!